SAVE when you buy the 3-volume set! More than 65 years ago MBAA created a simple, practical, technical book on all aspects of brewing in a user friendly question-and-answer format. 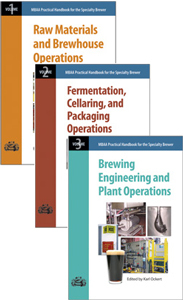 Building on that best-selling concept, this popular handbook series, written by MBAA experts, expands the Q&A format in a comprehensive manner, making it easier than ever to find answers to your questions on the broad subject of specialty brewing. The unique simplicity of the Q&A format makes understanding and application straightforward. Editor Karl Ockert has assembled a talented group of expert contributors from within the pub, craft, and large brewing communities, who write from their own experience and knowledge to bring you the know-how you need in order to answer real-life questions quickly and easily. Practical knowledge is the objective for this handbook series which stresses useful applications over theory. processes, and options used for producing Specialty Beers.